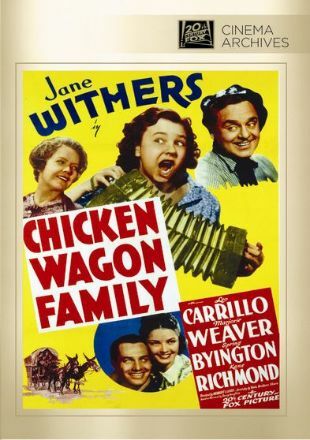 Based on a novel by Barry Benefield, Chicken Wagon Family affords nearly equal screen time to child star Jane Withers and veteran character actor Leo Carrillo. Tired of living in the boonies, itinerant merchant J. P. B. Fiffany (Carrillo) packs his family into his ramshackle wagon and sets out for New York. Alas, Fiffany has a fondness for poker, losing his hard-earned wages as quickly as he gets them. Fortunately, his enterprising daughter Addie (Jane Withers) is a human cornucopia of money-making schemes, and it is she who saves the day. Chicken Wagon Family was originally purchased by Fox as a Will Rogers vehicle, but was put on the back burner when Rogers died in 1935. Musical highlights include Jane Withers' boisterous rendition of "Daughter of Mademoiselle," originally performed by Louise Hovick (aka Gypsy Rose Lee) in The Battle of Broadway (1939).